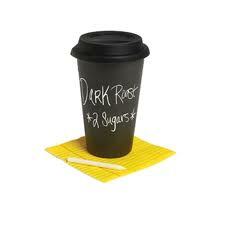 The Chalkboard Edition of "I Am Not A Paper Cup" features a double ceramic wall and a real chalkboard surface exterior! This distinct cup style will certainly set your cup of joe (or cuppa tea!) apart from the rest; label the contents, share a witty saying, or decorate to reflect your mood (though you might want to wait until after your first morning cup). Also Includes silicone lid (make sure lid and lip of cup are dry before putting lid on otherwise it may not seal) and white chalk so you can start decorating right away! 100% lead free, non-toxic. Dishwasher & Microwave safe.